This genus is accepted, and its native range is Tropical & Subtropical Old World to SW. Pacific. Annual (3), or perennial (24). 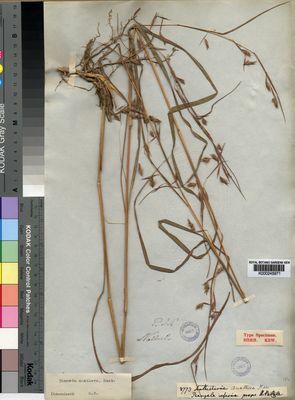 Rhizomes absent (26), or elongated (1). Culms erect (20/23), or geniculately ascending (7/23), or decumbent (1/23); robust (9/11), or slender (2/11); 15-152.2-600 cm long; firm (26), or wiry (1); without nodal roots (1/3), or with prop roots (2/3), or rooting from lower nodes (1/3). Culm-internodes terete (2/3), or elliptical in section (1/3). Lateral branches lacking (1/5), or ample (4/5). Ligule an eciliate membrane (9), or a ciliolate membrane (17), or absent (1). Leaf-blade base without a false petiole (26), or with a brief petiole-like connection to sheath (1). Leaf-blades linear, or lanceolate (1); stiff (2), or firm (23), or flaccid (2). Leaf-blade midrib conspicuous (2/5), or widened (3/5). Synflorescence simple (1), or compound (26); scanty (4/26), or linear (3/26), or paniculate (10/26), or fasciculate (9/26). Inflorescence composed of racemes; terminal (1), or terminal and axillary (26); not deciduous as a whole (25), or deciduous as a whole (2); subtended by a spatheole; exserted (3), or embraced at base by subtending leaf (2), or enclosed (23). Spatheole linear (6), or lanceolate (24), or ovate (1); scarious (25/25). 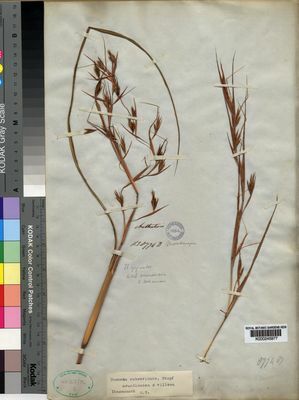 Racemes single; oblong (8), or ovate (1), or cuneate (18); bearing a triad of spikelets (2), or few fertile spikelets (25); bearing 1 fertile spikelets on each (14), or 2 fertile spikelets on each (17), or 3 fertile spikelets on each (3), or 4 fertile spikelets on each (2). Rhachis tough (2), or fragile at the nodes (25). Rhachis internodes indefinite (21), or linear (6). Spikelets in pairs (17), or in threes (16). Fertile spikelets sessile; 1 in the cluster (26), or 2-3 in the cluster (1). Companion sterile spikelets pedicelled; 1 in the cluster (18), or 2 in the cluster (16). Pedicels linear (1), or oblong (26); tip oblique (11/11). 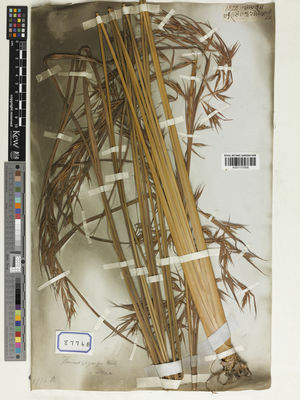 Basal sterile spikelets represented by a single scale (1), or well-developed (26); forming an involucre about the fertile; persistent (25), or deciduous with the fertile (2). Companion sterile spikelets well-developed; deciduous with the fertile (3), or separately deciduous (24). Companion sterile spikelet callus indistinct (1), or oblong (4), or linear (22). Spikelets comprising 1 basal sterile florets; 1 fertile florets; without rhachilla extension. 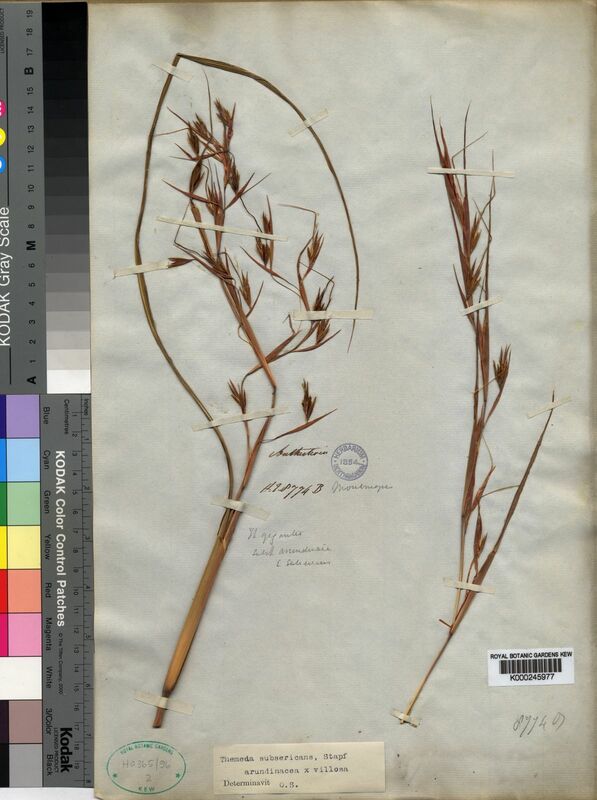 Spikelets lanceolate (1), or elliptic (23), or oblong (3); subterete (22), or dorsally compressed (5); 2.5-7.134-17 mm long; falling entire; deciduous with accessory branch structures. Spikelet callus brief (1), or square (1), or oblong (10), or cuneate (9), or linear (6); pubescent (4/24), or pilose (3/24), or bearded (17/24); base obtuse (9/26), or acute (5/26), or pungent (12/26); attached obliquely. Basal sterile spikelets represented by a single scale (1), or well-developed (26); forming an involucre about the fertile; persistent (25), or deciduous with the fertile (2). 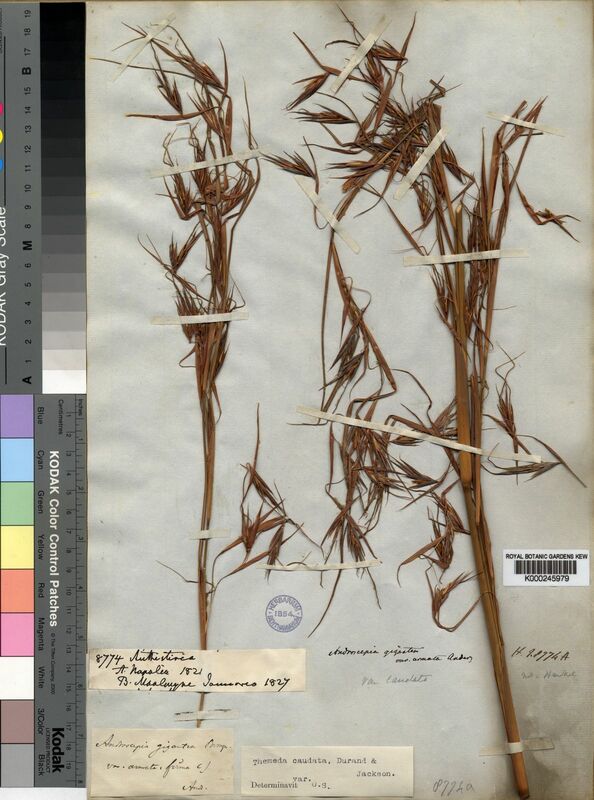 Companion sterile spikelets well-developed; deciduous with the fertile (3), or separately deciduous (24). Companion sterile spikelet callus indistinct (1), or oblong (4), or linear (22). Spikelets comprising 1 basal sterile florets; 1 fertile florets; without rhachilla extension. 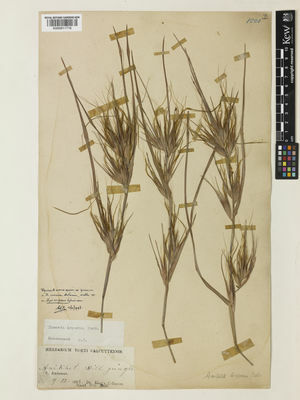 Spikelets lanceolate (1), or elliptic (23), or oblong (3); subterete (22), or dorsally compressed (5); 2.5-7.134-17 mm long; falling entire; deciduous with accessory branch structures. Spikelet callus brief (1), or square (1), or oblong (10), or cuneate (9), or linear (6); pubescent (4/24), or pilose (3/24), or bearded (17/24); base obtuse (9/26), or acute (5/26), or pungent (12/26); attached obliquely. Glumes exceeding apex of florets; firmer than fertile lemma. Lower glume lanceolate (2), or oblong (24), or ovate (1); chartaceous (1), or cartilaginous (1), or coriaceous (25); without keels; 1 -veined (1/12), or 5 -veined (2/12), or 6 -veined (1/12), or 7 -veined (4/12), or 8 -veined (3/12), or 9 -veined (5/12), or 10 -veined (1/12), or 11 -veined (4/12). Lower glume lateral veins absent (1), or distinct (26). Lower glume surface convex (21), or flat (3), or concave (1), or with a longitudinal median groove (2); smooth (23), or asperulous (2), or scabrous (2); glabrous (9), or puberulous (5), or pubescent (10), or pilose (2), or hirsute (2), or villous (1), or hispidulous (1). Lower glume apex truncate (6/18), or obtuse (10/18), or acute (2/18). Upper glume lanceolate (2), or oblong (25); chartaceous (2/16), or cartilaginous (1/16), or coriaceous (13/16); with undifferentiated margins (26), or membranous margins (1); 2-keeled (1/1); 3 -veined (14/14), or 4-5 -veined (1/14). Upper glume primary vein eciliate (25), or ciliate (2). Upper glume surface glabrous (24), or pubescent (1), or pilose (1), or villous (1). Upper glume apex truncate (4/5), or acute (1/5). Basal sterile florets barren; without significant palea. Lemma of lower sterile floret linear (1), or lanceolate (12), or elliptic (1), or oblong (11), or ovate (2); hyaline; 0 -veined (3/6), or 1 -veined (2/6), or 3-5 -veined (1/6); acute (1/1). Fertile florets bisexual (25), or female (2). Fertile lemma linear (21), or lanceolate (5), or oblong (1); hyaline; without keel; 1 -veined. Lemma apex acute (3/3); muticous (4), or awned (25); 1 -awned (25/25). Principal lemma awn straight (2/25), or geniculate (23/25), or bigeniculate (1/25). Column of lemma awn glabrous (2/23), or hispidulous (11/23), or puberulous (6/23), or pubescent (1/23), or hirtellous (2/23), or hirsute (1/23). Palea present (1), or absent or minute (26); hyaline (1/1). Lodicules 1 (1/2), or 2 (1/2). Anthers 3 (8/8). Caryopsis with adherent pericarp (1/1). Africa (3), or Temperate Asia (14), or Tropical Asia (22), or Australasia (5), or Pacific (6), or North America (1), or South America (2). Homogamous spikelets all sessile, persistent. Sessile spikelet terete; callus obtuse to pungent; lower glume coriaceous, rarely grooved, obtuse; lower floret reduced to a hyaline lemma; upper lemma stipitiform and passing directly into a puberulous or pubescent awn, or hyaline and awnless Pedicelled spikelet ♂ or barren, narrowly lanceolate, awnless, with a long slender callus as long as or longer than the true pedicel (this often reduced to a little stump). Pedicelled spikelet ♂ or barren, narrowly lanceolate, awnless, with a long slender callus as long as or longer than the true pedicel (this often reduced to a little stump). Ligule very short, membranous; leaf laminas linear. Inflorescence composed of solitary racemes embraced by colourful sheathing spatheoles, the racemes single or more often densely packed in fan-shaped clusters on a flexuous peduncle and gathered into a leafy false compound panicle; racemes comprising 2 homogamous spikelet pairs forming a sort of involucre, and 1–4 sessile spikelets with their pedicelled attendants; internodes linear. Sessile spikelet terete or dorsally compressed; callus obtuse to pungent; inferior glume coriaceous, not grooved, obtuse at the apex; inferior floret reduced to a hyaline lemma; superior lemma stipitiform and passing directly into a puberulous or pubescent awn, or hyaline and awnless. Homogamous spikelets all sessile, the pairs separated by a short internode, persistent. Pedicelled spikelet male or barren, narrowly lanceolate, awnless, with a long slender callus as long as or longer than the true pedicel (this often reduced to a little stump). Argentina Northeast, Argentina Northwest, Brazil South, California, Comoros, Cuba, Dominican Republic, Fiji, Florida, France, Haiti, Hawaii, Honduras, Iraq, Jamaica, Kansas, Leeward Is., Louisiana, Maryland, Mauritius, Mexico Central, New Zealand North, New Zealand South, Puerto Rico, Réunion, Seychelles, Virginia, Windward Is. 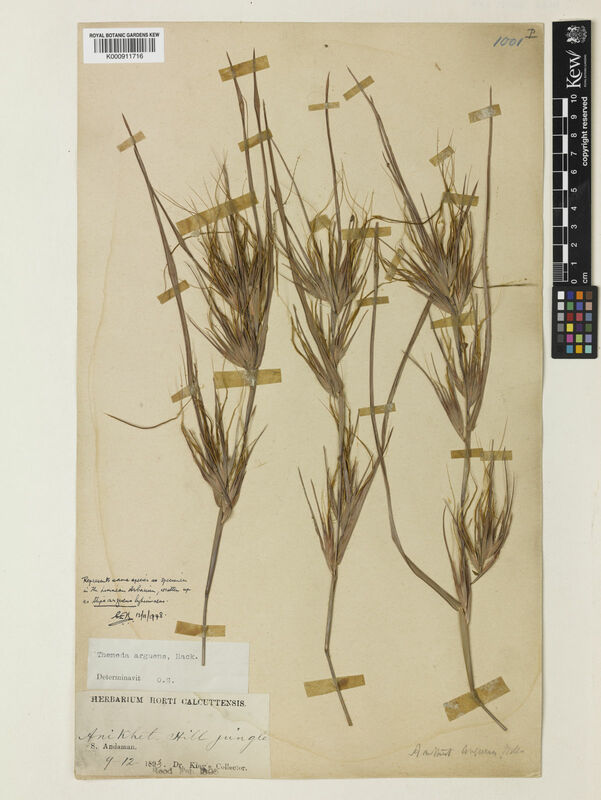 Themeda avenacea (F.Muell.) T.Durand & B.D.Jacks. 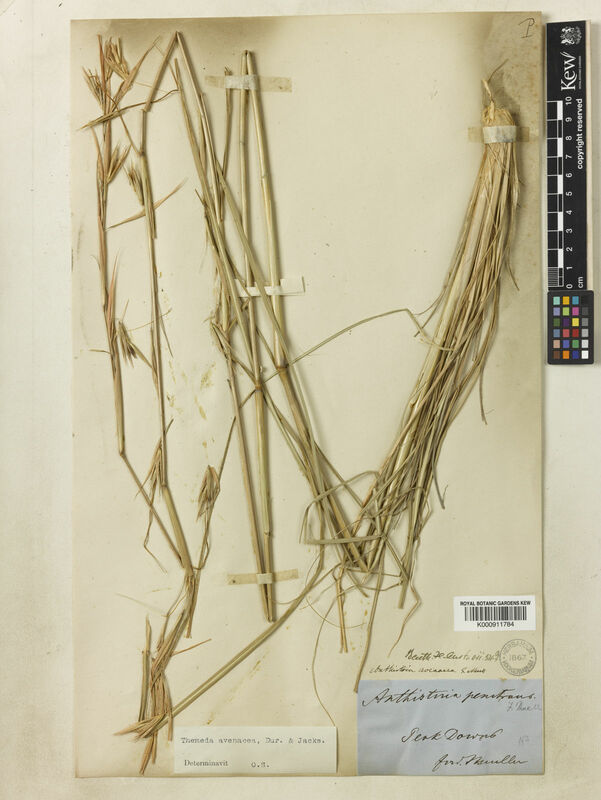 Themeda tremula (Nees ex Steud.) Hack.